These arguments are the equal and opposite of the arguments covered in I. LVT would not raise enough revenue. Surely they can't both be correct? And of course, the Home-Owner-Ists like to confuse the issue by saying things like "LVT would not raise enough revenue, so the government would keep increasing the tax rate" and then "The rate would be so high that we would go past the top of the Laffer Curve and so receipts would fall again", thus safely hedging their bets without realising that they have just completely contradicted themselves and betrayed their lack of understanding of the Laffer Curve. 1. "The government will introduce LVT on top, without reducing existing taxes"
Given how unpopular LVT is with the brainwashed majority, this is highly unlikely. As long as Labour are in the pockets of bankers and the Tories in the pockets of landowners, LVT seems a highly unlikely proposition (they won't even go as far as a Council Tax revaluation); and if they did come to their senses, then politically at least, they would know that LVT could only ever be introduced as a replacement tax. 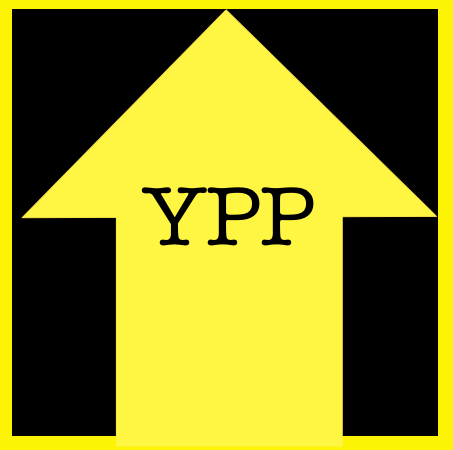 If and when enough people vote for smaller parties who have full-on LVT front and centre in their manifestos, the two big parties who take turns running the government will only dare introduce LVT very incrementally, in the same way as it took Thatcher and Blair/Brown twenty years to completely reverse the old 20th century system when it was government policy was to keep prices and rents down. If the government decided to continue with wasteful spending and corresponding deficits, it is better for the Baby Boomers to pay a less harmful tax now than simply to dump an even larger burden on future workers, entrepreneurs and investors. Even if they reined back spending to sensible levels and reduced the annual deficit to nil, there is still a massive accrued public sector debt; if they introduced 100% LVT it would still take ten years or so to pay it off, and then after ten years we can have another debate about which taxes to cut. 2. "The government will keep increasing the tax rate"
Nobody said that when LVT is introduced we will suspend democracy. There'll always be plenty of political parties who will try and buy some easy votes by promising to freeze or reduce LVT. It's a question of whether they have a credible programme for reducing spending or increasing other taxes to match. And yes, politicians love increasing taxes, but this is particularly difficult with an in-your-face tax like LVT. So that's a good thing, not a bad thing. And let's not forget about geese, feathers, hissing and all that. A couple of years ago they hiked VAT from 17.5% to 20%, which they said would raise another £13 billion a year and nobody batted an eyelid. Just imagine the outcry if they'd decided to raise that £13 billion a year by increasing Council Tax by 50%! The main reason that revenues start to fall again once the overall rate is more than 60% is because enterprise is choked off. 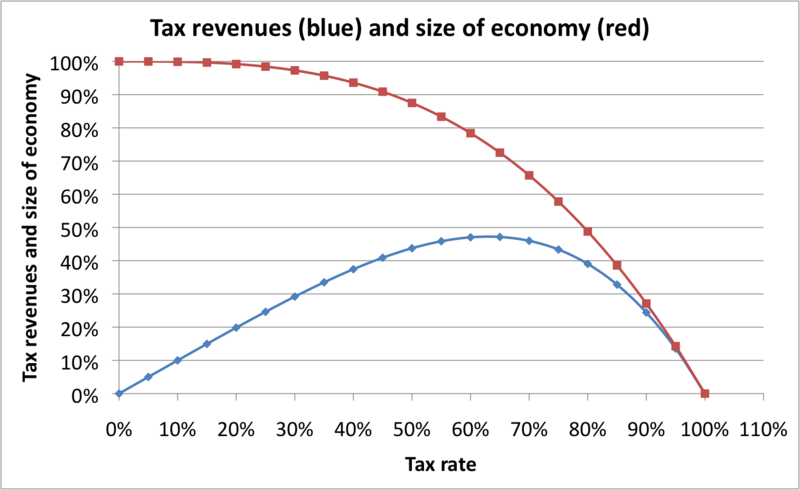 If you add an extra line to the chart, the upper line shows by how much the total size of the economy shrinks at higher tax rates. These losses (the area above the red line) are referred to as the deadweight losses of taxes. So yes, the UK government is maximising tax revenues by having an overall rate of 50% - 60% on the productive economy (income tax + NIC + VAT), but the price we pay is having an economy that is 15% - 20% smaller than it could be. ii. LVT has no deadweight costs, if anything it stimulates the economy. So the optimum tax rate for LVT is somewhere near 100%. It's probably better to pitch it at 90% to go on the safe side, but if the rate does creep over 100% occasionally, well so what? 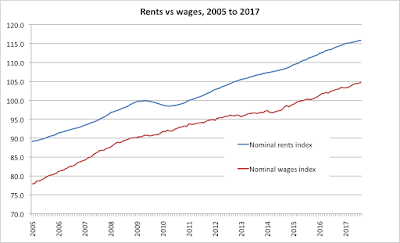 All that means is that it doesn't just tax the rental value of the location but some of the rental value of the buildings and improvements as well, and it is still less bad taxing static rental income than mobile labour and investments. iii. If the rate does go measurably over 100% in some areas then the first thing that we would notice is that new construction would stop (the same as punitive Section 106 agreements or Development Land Tax); but this is what the NIMBY majority want, isn't it, so that is not an unalloyed bad. The tax would still be collected from existing buildings (and it would still act to encourage the most efficient use of existing buildings). iv. For sure, buildings still have to be maintained and improved, but it is better having a Poll Tax on the buildings themselves whatever condition they are in than to levy a tax on the cost/value of improvements. The tax rate would have to be very high indeed (100% of the site premium and let's say 75% of the bricks and mortar rental value) before people started abandoning buildings. v. And if the tax rate does go significantly over 100% of the site premium, then that is simply not LVT any more, that is a "Property Tax" like Business Rates, which is a quite different animal and to which proper LVTers are opposed anyway. vi. So it's not an argument against LVT, it's an argument for replacing Business Rates with LVT. Or we could equally argue "Income tax is a bad tax because the government could increase the rate past the top of the Laffer Curve or increase it to beyond 100%" in some cases, the government does. That's not an argument against income tax, that's an argument against colossally stupid governments. 3. "People will never know how much tax they will have to pay next year"
Life is full of uncertainties. LVT merely puts everybody in the same position as tenants or mortgage borrowers who don't know what their rent or interest rate will be next year. i. During the transitional phase, you would know that you will pay £x less in income tax next year and £y more in LVT; you'd easily be able to predict the changes by comparing x% of your earned income with y% of the site rental value of where you live. If you have a low earned income relative to the site rental value, then you know that your overall tax bill will increase every year, but this is predictable years in advance and you have plenty of time to take evasive action (like "getting on your bike"). And for a majority, the tax bill will be falling slightly year-on-year! ii. If we ever get as far as a full-on LVT system, then if your LVT bill this year was £z, then next year it will be £z plus or minus a bit. 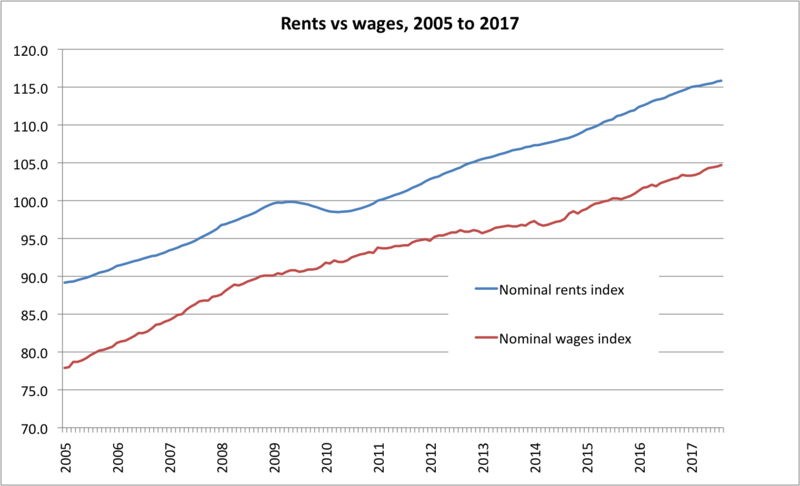 Rental values are very stable and only change by a few per cent each year, in line with wages. iii. So this is no bigger burden than expecting somebody who takes out a mortgage at 4% interest to be prepared for the fact that it might be 6% interest in ten years' time (i.e. a fifty per cent increase in monthly repayments). As it happens, people tend to worry more about upside than downside risks, so all in all, this will keep house prices low and stable, even if the feared "tax bombshell" never explodes. iv. Common sense says that increases would be capped at (say) 5% a year, enabling people to budget years in advance, even in a "worst case" scenario. And we know from experience that the government can get away with making higher earners take a hit of several thousand pounds from one year to the next (increase in tax rate from 40% to 50% or withdrawal of Child Benefit) without them taking to the streets. v. The only time when rental values jump noticeably is when e.g. a new railways line and stations are opened, but these projects are announced years or even decades in advance, giving plenty of time for evasive action. So people who aren't interested in taking the train will have left by the time it opens, and people who need or want to use the train service will move to the area and happily pay the higher rent/tax. Thus we get far more efficient use not just of the physical land and buildings but of the railway as well. vi. What's not to like? 4. "At least with income tax, if your income falls, then your tax bill falls"
Fair point, even though it contradicts the previous supposed argument. What the Homeys want is a tax bill that doesn't go up in the good times, but does go down in the bad times. You can't have it both. As ever, they refuse to accept that there is an inherent contradiction. In terms of "ability to pay", income tax beats LVT in the short term, but in the medium term LVT catches up again and overtakes it in the long run. A price well worth paying in exchange for lower dead weight costs; lower collection and compliance costs; and better social cohesion. And the politicians are always coming up with new ways of subsidising the "savings culture" (an excuse for bungs for the financial services sector), none of which seem to work, so how about trying the "stick" as well as the "carrot"? Everybody will make sure that they have some rainy day money just in case. 5. 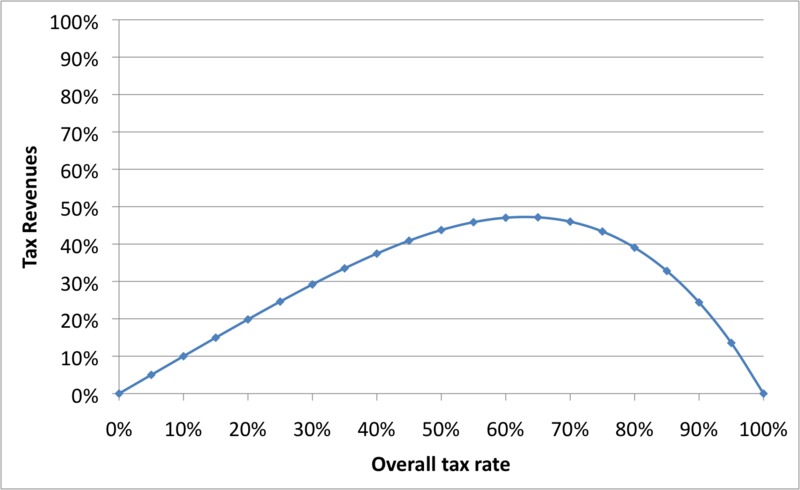 "At least with income tax, there is a Laffer Curve which sets an upper limit to tax collection"
i. 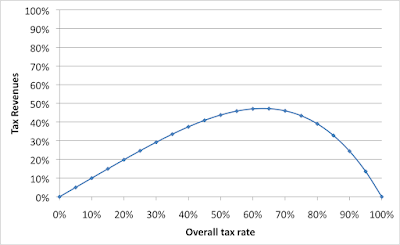 Yes, the Laffer Curve (see point 2 above) sets an upper limit to income tax (which is why they have several layers of it, VAT, NIC, corporation tax, income tax and so on) but the only way to find out what the revenue maximising rate is is to get there and thereby hugely damage the economy. Many politicians and campaigners on the left of the spectrum deny that it even exists. ii. We're currently at an average marginal rate of over 50% and the dead weight costs of that are, on a rough and ready basis approx. 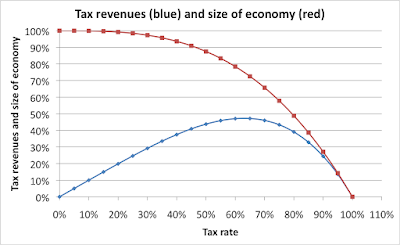 15% - 20% of the potential size of the economy (the tax rate cubed). iv. LVT has no deadweight costs (and in fact, tends to stimulate economic activity); it only has deadweight costs if the tax is more than 100% of the site premium and thus acts like a tax on the income from buildings and improvements, but even then, as explained, the dead weight costs are negligibly small. "People are afraid of this because they do care of their everyday life and they maybe afraid that this money will just go straight to the pocket of our leaders." Perhaps he has never wondered to the taxes he/she already pays? G, well yes, perhaps LVT would end up as an additional tax, but there are plenty of people who receive no rental income anyway, why should they care? See item 1 to this post.